Dance lessons will resume on Friday, January 19th. They are held at the Forks Congregational Church’s Fellowship Hall and begin at 7:00PM. The lessons are for people of all skill levels, but the main emphasis is on ensuring that beginning dancers can join us on any Friday, and feel comfortable. Each week begins with a review of the previous week’s lessons. 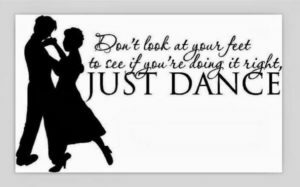 The instructors, Jane and Terry Heilman, are very skilled and patient, and the other dancers are very welcoming to newcomers. We love to dance, and we never bite. Dancers frequently change partners, therefore having a partner is not required. The lessons are free. Some people make a small donation for the instructors gas expenses, but this is not required. Please join us on Friday. We are friendly, and we laugh a lot. No experience is necessary, and no partner is necessary.